Marie Mullen in "Testament" by Landmark Productions and Ulster Bank Dublin Theatre Festival as part of the 2011 Ulster Bank Dublin Theatre Festival. Photo by Patrick Redmond. It took deft wordsmithing to craft the publicity blurb for "Testament," Colm Tóibín's new play that had its world premiere at the Ulster Bank Dublin Theatre Festival earlier this month. What, exactly, can we expect when we read that a piece treats a "a woman who was forced to bear an unimaginable burden in tumultuous times?" Or that a drama "asks big questions about what we believe, who we believe, and why?" Joan of Arc? Indira Ghandi? The playwright's mother? The mysterious tease continued as the audience proceeded into a small performance space via a barely-lighted, narrow pathway covered with dirt to enter the theatre proper via the stage itself. The single-person-at-a-time-through-a-door is exactly where the solo performer, Marie Mullen, would also enter, into a space from which we were to understand there was no escape. I rarely look for exit signs in a theatre, but this setting and approach had me checking twice. It felt eerily like lockdown. Designer Francis O'Connor created a dark, starkly simple cottage with a plank floor, dull stucco walls, the feeling of no windows, and two small tables separated by an ocean of space. There was a pile of dirt in one corner. The smaller table — really a writing desk — had scrolls on it, as well as scrolls in a trunk beside it on the floor. The other table was pushed up against a chair that was forced to the wall and would be hard to access. It was pretty clear no one was going to sit down. And that all these items — along with a few jugs and a bucket — mattered. Marie Mullen, the single player in "Testament," is an actress for whom some of us would pay money for her rendition of the phone book. 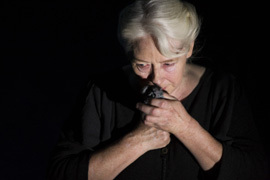 (New York audiences first encountered her in "The Beauty Queen of Leenane.") Her entrance in "Testament" was swift, silent, and strong. She wore a long robe from an indeterminate era, her long white hair in a single braid. Her need to speak was palpable. Her character's story unfolds slowly, but with a desperate need to tell it. In short order we learn that this woman has regular visitors who are absent at the moment but who will be back. They watch her; they question her; they write things down. They are dismissive of her directive that no one sit in the chair shoved up against the wall. It belonged to her husband, who will not be back, and she threatens to kill anyone who sits in it. The men want her version of "what happened." And so she tells it, but not to them. She tells it to us, as though rehearsing or unburdening herself, or confessing. She knows she will never be able to leave this cottage and she finds solace in visits to the shrine of Artemis and in a small statue of the goddess that she keeps hidden most of the time. Her story will never be written down or believed. Hence the importance of our hearing it, since her interlocutors refuse it. Once her story begins, her identity is clear. But that is perhaps misleading. A cousin Miriam, a dying Lazarus, a son with followers all tell us that this is Mary, but Tóibin's play makes it clear that we don't know Mary at all. Whatever we think we know of Mary is the stuff of legend and not of testimony. This Mary is stunned and insulted by the fiction of a virgin birth. She misses her husband. She remembers the fear and the urgency of getting out of harm's way – fast – after the crucifixion. The visitors' insistence that the world has been saved by her son's death is of enormous importance to them and meaningless to her. They need to believe and in their need, they screen out parts of her truth that do not serve their agenda. They want her testimony, but she will never be part of their creed's testament. At least not in her own words. I won't reveal Mary's final, explosive, conclusion to the story she tells and the story she is being fed, but her denouement is a snapshot of her new life. "I did not go to the synagogue ever again," she tells us, and the litany of names that offer peace is perhaps not what we would expect: Psyche, Phoebe, Persephone, Morpheus, Hypnos, Athena. The last is the goddess of reason, to whom Mary prays that she "help me remember what I know to be true." Garry Hynes directed "Testament" with attention to the need to find variety within constraints, a mirror of her single character's scripted need. The play seems to fall into about a dozen discrete sections, each of which got a fresh attack and perspective as Mary moved to a new place in the cottage. Her positioning alone put focus on the monumental importance of each item in her spare but deeply felt world. Peter Mumford's tour-de-force lighting design managed to keep the cottage dark even as we saw wide open sky above. The universe may be endless, but trapped in a corner of it, one can at best see irony and at worst slip from frustration into despair. Despair, was not, however, the feeling with which I left this extraordinary gem of an evening. Call it feminist revisionism, call it a historiography built on alternative faith, call it what you will. This Mary inspires with her backbone and restores the power of the word to a place around which the Gospels took a detour.